We’ve all been to those wedding receptions that seem to drag on and on: a cocktail hour that lasts for two, speeches that seem to never end, and other delays that cause guests to yawn before the cake is even cut. So how can you make sure your guests enjoy the celebration and don’t spend the night checking their watches? 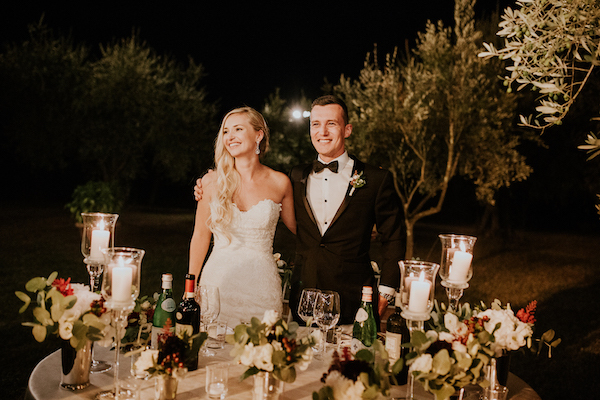 Read on for their tips for creating a timeline for a fun and festive reception that still honors the traditions! If guests feel like this part of the event moves slowly, they’ll definitely be burned out by the time you open up the dance floor! 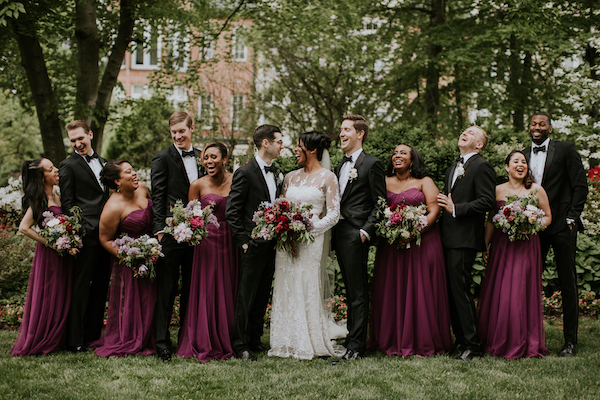 Usually, this portion of the evening is when couples do their wedding portraits and bridal party pictures, so one option for avoiding the lag time is to do a “first look” with your groom before the ceremony! That way, the only photos you need to take after the ceremony are family photos. Even if a first look isn’t your thing, be super organized and intentional about your photography time. We made a list the photographers of who we wanted pictures with. That helped speed things along when taking portraits and family photos after the ceremony. -Jean W.
“All big events at the beginning! Intros into first dances into cake cutting and then have the speeches during dinner while people are eating their entrees! This way you can get right to the dancing! One other thing we did was not dance to full songs. Besides our first dance (because my sister-in-law wrote and sang our first dance song) the mother-son and father-daughter dance was not the full song but probably like three-fourths of it. -Jean W.
Jeff and his mom did their dance at the same time as my dad and I. Jeff and I don’t love being in the spotlight. And we still got great individual pictures without dragging that out. -Cristina O. 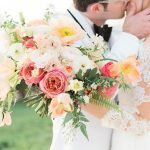 While you’ve most likely been to dozens of weddings, the coordinators, photographers, caterers, and DJ’s have been to hundreds. They’ve seen it all, so trust their professional judgement when it comes to timing the meal service, speeches, and dancing. And consider hiring a day-of coordinator to move your timeline along once you’ve decided on the details! The biggest help was having [a coordinator] during the reception. She made sure we stuck to our timeline. -Katie B. While many couples ask a relative or friend to “emcee” the wedding, in my opinion, this is a risky move. 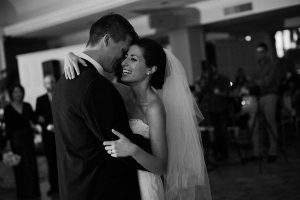 I recommend choosing a DJ who you trust to keep introductions quick and keep the reception moving! Our DJ was fantastic about how the evening would go and he gave each person a time limit for their speech. Also, if a song was playing and nobody was feeling it, he quickly changed to a new one. 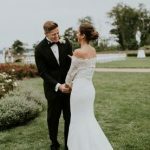 -Alyson R.
If you’re really concerned about time (or you have very shy speakers), you might consider moving the speeches to the rehearsal dinner. We also did all of the speeches during the rehearsal dinner so all the family that wanted to speak could and didn’t have to be limited to a certain time. 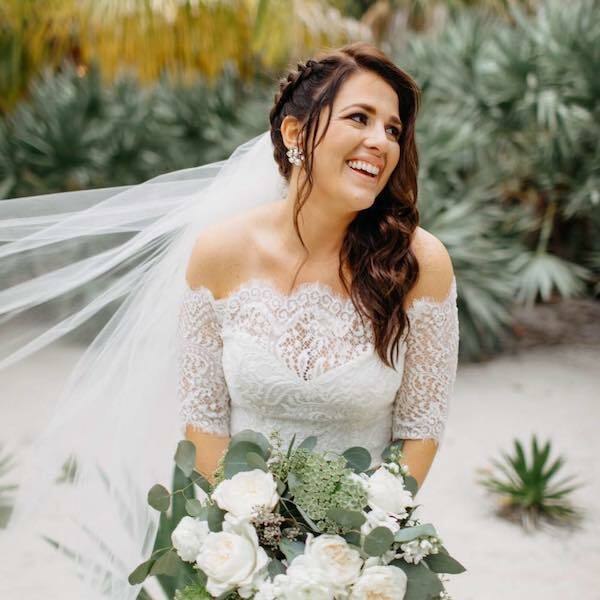 -Jean W.
I think all wedding guests love hearing from the father of the bride, maid of honor, best man, and groom, but any other speeches (and open mic opportunities) should take place at the rehearsal dinner! I usually recommend the guests eating (either buffet open or passed hors d’oeuvres) with open bars/drink stations as soon as guests arrive. Then intro (just B&G, bridal party intros are out of style), first dances, a short welcome toast. Then B&G greet guests while eating so no lines form. Cut the cake no later than 2 hours into your reception. Here’s a timeline I used for my own wedding 7 years ago! 9:30: Last Dance, move guests outside for exit and distribute flower petals, bubbles, sparklers, etc. If possible, hold your ceremony and reception at the same venue, or at venues that are very close by. Long car rides and Uber trips for guests mean some festive momentum may be lost between the ceremony and reception! 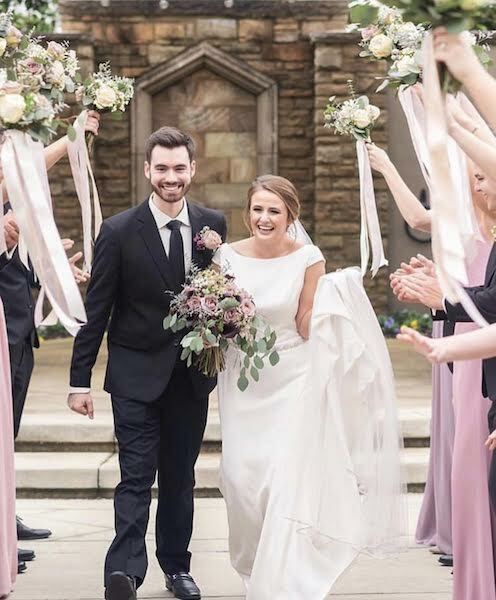 Be realistic about how many photos you can take after the ceremony while your guests are enjoying the cocktail hour (emphasis on the singular “hour”). It may not be feasible to get portraits with your groom and bridal party, plus multiple configurations of family photos. If you have to sacrifice something, I would recommend minimizing the number of poses with the entire bridal party-you’ll probably only put one or two in your album. Avoid long lines at all costs: set up table cards and the guest book in a large area so there are no “traffic jams;” greet guests during dinner instead of having a receiving line; consider setting up multiple “food stations” instead of a single buffet line. Some couples choose to have a two or three-hour gap between the ceremony and reception-I don’t recommend it. 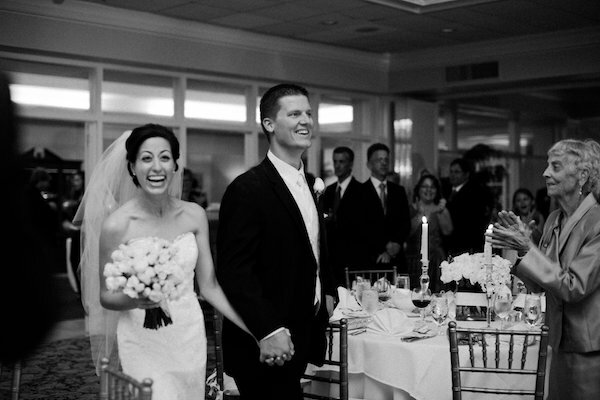 While it gives the couple plenty of time for pictures, your guests are left waiting around for the reception to start. I’ve actually found myself sitting at an Arby’s in formal wedding attire, wondering if I should order a roast beef sandwich and Diet Coke or wait for the appetizers and cocktails. Consider skipping traditions like the bouquet and garter toss. They often cause a break in the flow of the evening, and no woman over the age of 12 enjoys being trotted out to Beyonce’s “Single Ladies” and lunging for the bouquet. 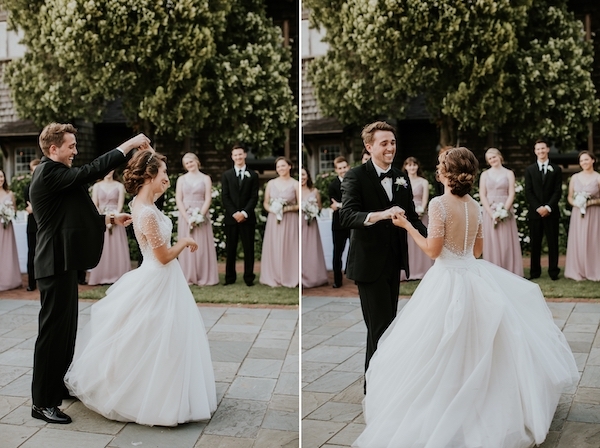 Thanks to YouTube, many couples and families are planning elaborate choreographed dance routines and creative speeches in an effort to “go viral.” While you can’t control what your family or groom will do, these planned stunts have a greater likelihood of creating an awkward drag at your wedding than being featured on Ellen. Just don’t do it. 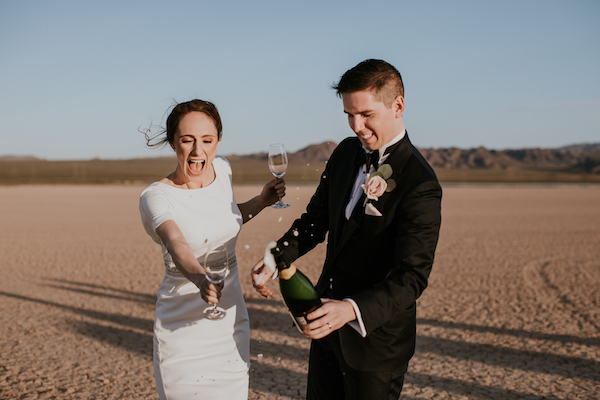 I think that about covers our tips for avoiding lengthy receptions, but I’ll leave you with one parting piece of advice: I’ve heard far less complaining from wedding guests when an open bar is involved! Keep the champagne flowing, and the party is bound to keep going! Cheers! May your wedding reception be the celebration of a lifetime! Have a Question for our Real Brides? Let me know what topic you’d like us to tackle next! 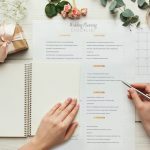 And if you’re interested in learning more about etiquette, gift giving, and celebrating in style, be sure to subscribe to the RegistryFinder GiveIt blog for weekly posts on wedding etiquette, bridal showers, wedding trends, and of course, wedding registry guidelines and tips! And as always, be sure to refer your guests to RegistryFinder.com, where they can conveniently locate all of your registries in one place!